As a pioneer in LED revolution in India, we at SYSKA were always keen to create a channel exclusive for our LED products. This wish is now a reality. We have created a dedicated spaces where our entire LED range including popular bestsellers, specialty products and recent innovations will be displayed in all glory. Let us join together to experience the future of light. Spread over 75 locations across India, offering customers advanced solutions of LED lighting ranging from Residential, Commercial Outdoor, and Industrial & Decorative. At present SYSKA's residential basket offers solutions that propose a new-lifestyle creation through them. While LED Lighting focuses on energy-saving and reliable lighting, the RoHS compliant products focus on protecting homes and lives from electrical hazards. 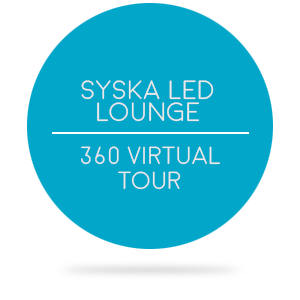 This enables SYSKA to focus on its key objective of creating efficient lighting solution, along with reducing energy costs for its customers and minimizing environmental impact. The showrooms also showcases SYSKA high efficiency Industrial range enabling SYSKA to provide a sustainable solution on huge cost saving front as well. We had a dream, a dream driven by collective reflection and a shared vision. There is a famous saying 'You are never too old to set another goal or to dream a new dream'. To put it straight, it was a dream to establish a retail chain with our brand & play a part in bettering the world's ecosystem through cutting edge technology. Today we find ourselves in an era where we are required to switch to the most energy efficient, cleanest & eco-friendly lighting. This focus & belief led our foray into the world of LEDs. With dedication, professionalism & solid business associates we find ourselves among the top players in the market today. Coming together is the beginning. Keeping together is progress. Working together is success. We are delighted to work with you as our business associate and welcome you to a future that is bright and light years ahead with SYSKA - Mr. Govind Uttamchandani. CONTACT US TODAY for Franchisee! Hear what over 1.2Mn satisfied customers say about us!